Firestar and Cinderpelt. (NOT MINE) I couldn't help post this... Im a big Fire+Cinder fan! ^_^. Wallpaper and background images in the Warriors (Novel Series) club tagged: warriors cats cinderpelt cinderpaw fireheart firestar. i never knew she liked him is it TRUE?! ^Yes, it was confirmed by Vicky. They should have been together... STUPID TIGERSTAR!!!!!!! He starts everything!!! I wish him and Sasha never mated so HAWKFROST was never born, so he wouldn't kill Hollyleaf!!!! I know of topic, but still! 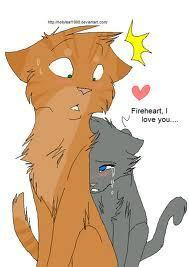 haha firestar is like what the crap get off me!!! HAHA! Oh wow, this is amazing. I'm a doggy and you just made me PURR! Dog purr? Hmm...That would sound stupid! Cats and Dogs peace FURever! Love, such a powerful thing. It can even make apprentices fall in love with warriors. I love this couple.